Our first glimpses into the physics that exist near the centre of a black hole are being made possible using "loop quantum gravity"—a theory that uses quantum mechanics to extend gravitational physics beyond Einstein's theory of general relativity. Loop quantum gravity, originated at Penn State and subsequently developed by a large number of scientists worldwide, is opening up a new paradigm in modern physics. The theory has emerged as a leading candidate to analyze extreme cosmological and astrophysical phenomena in parts of the universe, like black holes, where the equations of general relativity cease to be useful. Previous work in loop quantum gravity that was highly influential in the field analyzed the quantum nature of the Big Bang, and now two new papers by Abhay Ashtekar and Javier Olmedo at Penn State and Parampreet Singh at Louisiana State University extend those results to black hole interiors. The papers appear as "Editors' suggestions" in the journals Physical Review Letters and Physical Review on December 10th 2008 and were also highlighted in a Viewpoint article in the journal Physics. At the centre of a black hole the gravity is so strong that, according to general relativity, space-time becomes so extremely curved that ultimately the curvature becomes infinite. This results in space-time having a jagged edge, beyond which physics no longer exists—the singularity. Another example of a singularity is the Big Bang. Asking what happened before the Big Bang is a meaningless question in general relativity because space-time ends, and there is no before. But modifications to Einstein's equations that incorporated quantum mechanics through loop quantum gravity allowed researchers to extend physics beyond the Big Bang and make new predictions. The two recent papers have accomplished the same thing for the black hole singularity. "The basis of loop quantum gravity is Einstein's discovery that the geometry of space-time is not just a stage on which cosmological events are acted out, but it is itself a physical entity that can be bent," said Ashtekar. "As a physical entity the geometry of space-time is made up of some fundamental units, just as matter is made up of atoms. These units of geometry—called 'quantum excitations'—are orders of magnitude smaller than we can detect with today's technology, but we have precise quantum equations that predict their behaviour, and one of the best places to look for their effects is at the centre of a black hole." 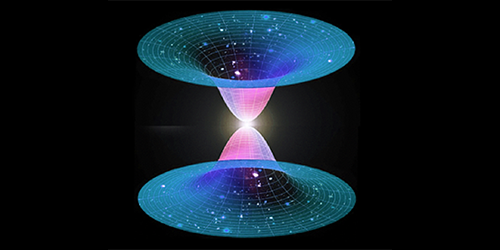 According to general relativity, at the centre of a black hole gravity becomes infinite so everything that goes in, including the information needed for physical calculations, is lost. This leads to the celebrated 'information paradox' that theoretical physicists have been grappling with for over 40 years. However, the quantum corrections of loop quantum gravity allow for a repulsive force that can overwhelm even the strongest pull of classical gravity and therefore physics can continue to exist. This opens an avenue to show in detail that there is no loss of information at the centre of a blackhole, which the researchers are now pursuing.